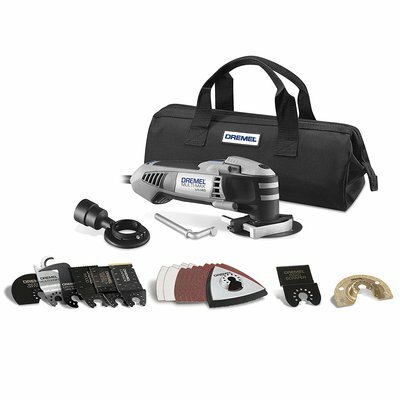 Key to a comprehensive Dremel MM-40-03 review is an appreciation of this tool kit’s power. Operating at 10,000 to 21,000 OPMs, the MM40-03 makes quick and accurate cuts in virtually any material. Equipped with an electric feedback function and a “soft start” feature, this tool gives the user greater control and constant speed under heavy loads. That power is put to use by a large variety of specific accessories. Its blades and saws are forged with particular materials and tasks in mind. Whether flush-cutting hardwood at surface levels, plunging through drywall or trimming fiberglass panels, you can rest assured that the MM40-03 has the right accessory. Particularly useful among its arsenal is the dust extraction implement that follows up after major cutting projects . Not to be forgotten is the conveniently places on/off switch within easy reach of the thumb—a vexing omission on some other oscillating tools. 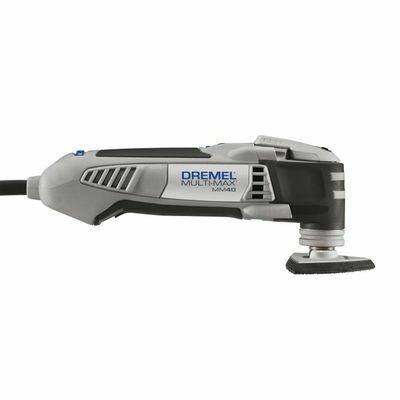 A limited two-year warranty accompanies this Dremel product. In an otherwise positive Dremel MM40-03 review, one customer complained that the blade holding mechanism broke and that Dremel—while replacing the component—nevertheless left it to the customer to absorb the shipping charges. An additional complaint involved a missing accessory from the original box. One Dremel MM40-03 review makes a strong point: the Quick Lock lever that allows for the tool-less change of blades is not unique to this model, but is rarely found in this price range. The simple forward/backward rotation of the lever is far more convenient than pulling out the Allen wrench. Another praised its streamlined design and ability to sand where his orbital sander was unable to reach. A cabinet maker celebrated the tool kit’s aptitude for precision cutting near beams and electrical wiring, as well as its lightweight design for extended periods of use. Positives far outweigh negatives regarding the Dremel MM40-03 2.5-Amp Multi-Max Oscillating Ultimate Tool Kit. In terms of power, precision, maneuverability and results, an unkind word can not be found. Satisfaction marks most every opinion published on this tool kit. Where disappointment lurked, it was rarely about product performance. Packaging and customer service came in for some isolated criticisms. To be fair, these are significant aspects of a purchase, so should not be discounted. At the same time, none published any unfavorable commentary with regard to completed projects. Universal contentment reigned among the full-time and after-hours home improvers when it came to this tool’s ability to get the job done. Utilizing a scale from zero to five, the Dremel MM40-03 gets a 4.5 which puts it among our top reviewed products.